Welcome to Day II of the 30 day Blogging Marathon.The main theme for this marathon is ‘A-Z’ and the sub theme, the one I have chosen is Sadya recipes. So this month, you will find recipes that can be prepared for a sadya coming to you in alphabetical order. 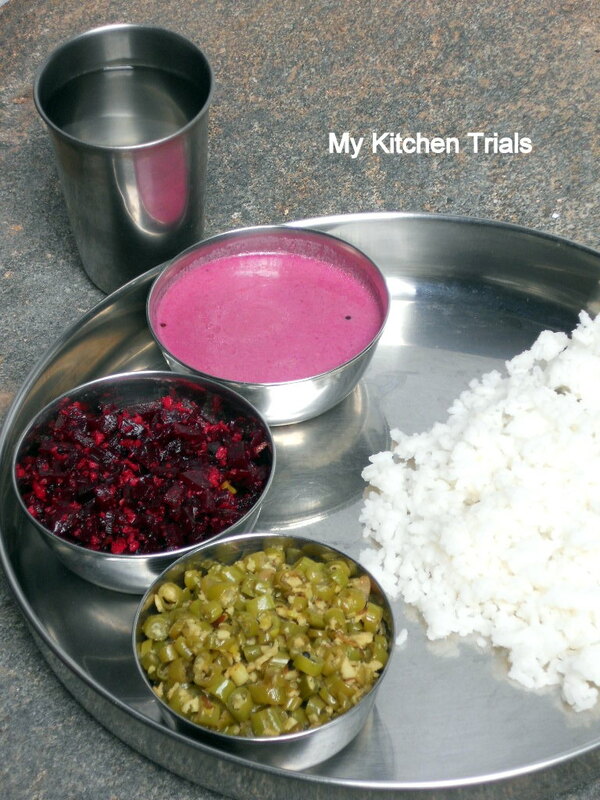 Day I was payasam & avial, and Day II has three simple recipes. For a traditional sadya, there are some ‘must have’ recipes. Payasam and Avial are in the ‘must’ list. A kichadi is also a must and a ‘thoran’ is usually made as its easy to make. A ‘thoran’ is a vegetable side dish. It is your choice of vegetable cooked with scrapped coconut and its a dry side dish. It’s similar to the Tamil Nadu porial. 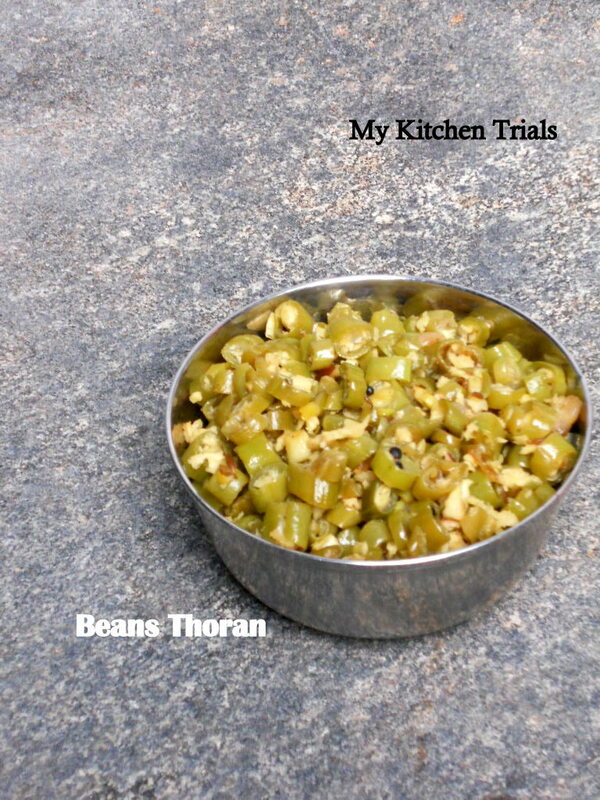 A thoran is an everyday recipe. It is usually served as a side dish to rice and Sambar (or any other gravy). My choices for today’s post is ‘B -based’ and its beans and beetroot. Thoran can be a mix of vegetables as well. Beans & carrot is a good combination, so is cabbage -peas, cabbage-carrot. There are many vegetables to choose from to make a thoran. Some vegetables like ladies finger and yam are used for mezhukkupirattis and not for thoran, though. Like I mentioned yesterday, I was in my native, Trivandrum, when I planned the first three posts for this series. For this post as well, it was my mother’s cook (she is of my age and cooks twice as fast as I do!) who did the main cooking and I was an assistant again. She made the beetroot curries while I took care of the beans. I clicked these pictures in our old house, a century old structure, now really old and beyond repair. It is right next to our new house (our ‘new house’ is 20 years old, but we still call it ‘new’ :D) We use the old house as kind of a garage now, but there is a strong connect with the place even now, after 20 years of moving out. That’s where I grew up and that’s special. The background for today’s pictures is an ammikallu. It’s a rectangular stone, used to crush/grind coconut for all the dishes in the olden days. You can see it below the window in the picture above. Kichadi and pachadi are two ‘must have’ dishes in a sadya. There are a lot of recipes to choose from for each, and these are very easy to make as well. Some of the easy kichadis include the ladies finger version and cucumber version(I will post that recipe later). You can check out the ladies finger kichadi here in this page. Pachadi has a sweet based taste(though yogurt is used for some recipes as well) and kichadi is yogurt based and savory. In some places, kichadi is called as ‘thayir pachadi’. You can have a cooked or an uncooked version of this kichadi. Skip cooking the beetroot for the raw version. Usually, only a small quantity is made as you serve only a tablespoon or so of this dish. Since you are adding curd to this dish, left overs should be refrigerated immediately. Else it will become really sour and wont be edible at all. Wash and peel the beetroot. Pulse it in a mixer until smooth. Add the coconut, ginger (optional), green chilies and mustard seeds. Grind till smooth. In a kadai, add the ground beetroot coconut mix and add a little water to avoid burning. Cook it for a couple of minutes. Add salt. Take off the heat. Mash the yogurt with a spoon. Once beetroot is cool, add the yogurt and mix thoroughly. Check seasoning and adjust according to your taste. In a small pan, heat oil for tempering. Add the mustard seeds and once they splutter add the curry leaves. 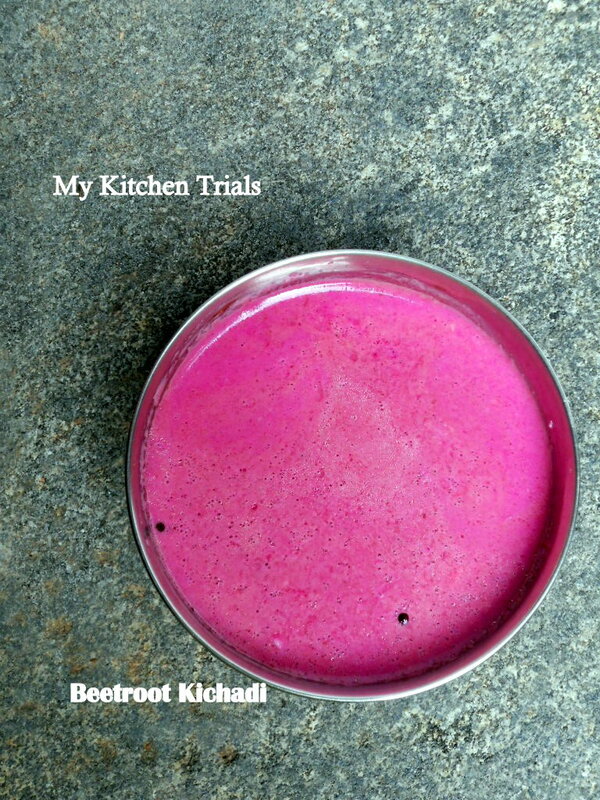 Once it changes color, take off the heat and pour it into the beetroot pachadi. There is not much difference between the preparation of the two dishes. Except for the choice of vegetables, the method is same. So check the recipe below and pick your choice of vegetable. A couple of garlic pods can also be added if you prefer. Optional items include an onion sauteed, green or red chillies. Wash and clean the vegetable. For beans, cut into small pieces (1/4″ long or smaller). 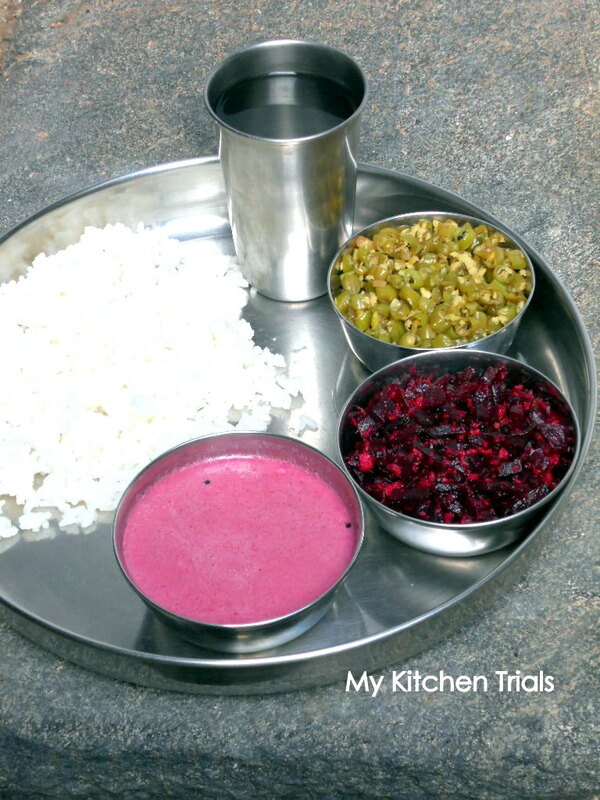 If you are using beetroot, it can be grated, diced or pulsed couple of times in mixie (not pureed) for this dish. 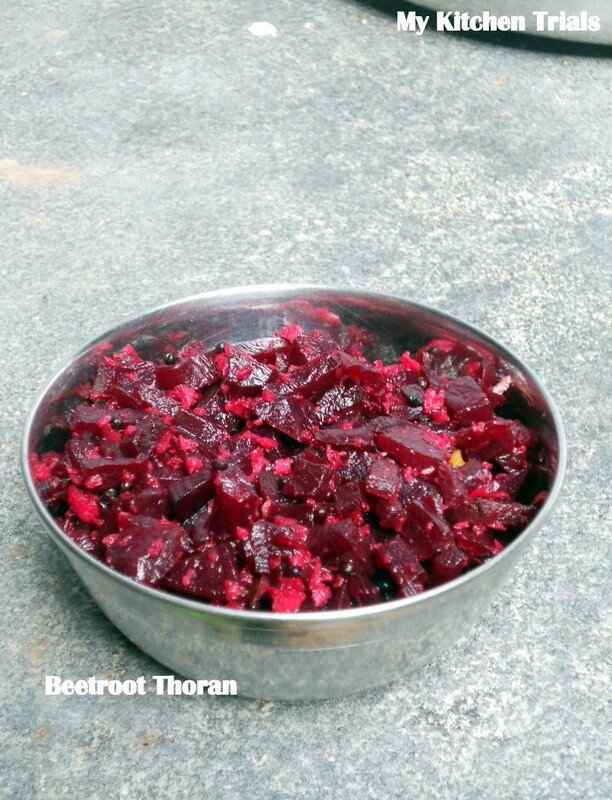 The shape is of your choice for beetroot thoran. Grind coconut, jeera and chillies together to a coarse paste. It shouldn’t be very smooth. Heat oil in a pan. Add mustard seeds and once it splutters, add curry leaves. When it changes color, add the beans/beetroot. Mix using a long spoon and let it cook for a minute or two. Sprinkle a bit of water and cover and let it cook. Check in between and stir, to avoid the thoran sticking to the pan. You can sprinkle some more water if that is the case. When the vegetable is completely cooked, add the ground coconut and salt. Mix thoroughly. Cook for a further 3-4 minutes and check the seasoning. Turn off the gas and serve as a side dish to rice. Omg, u rock gal, i think none can beat u in posting more than a recipe for this BM; wonderful platter. 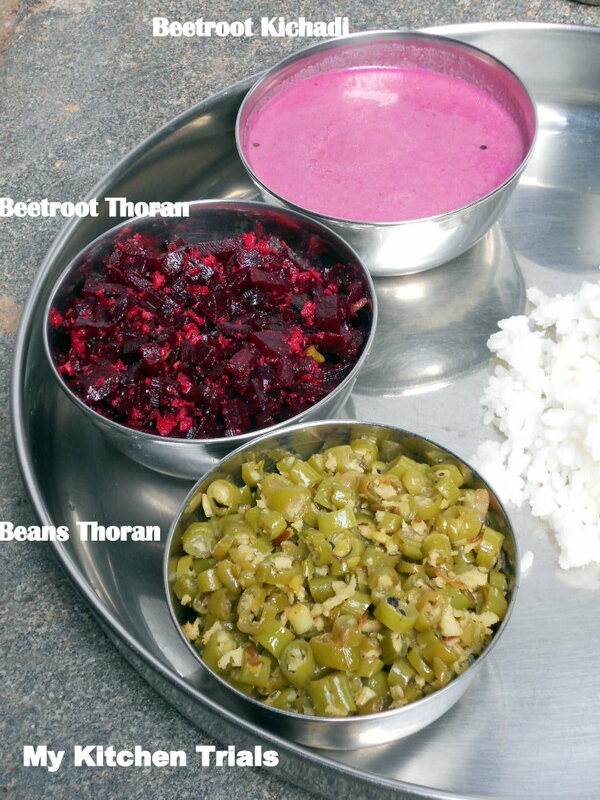 wow so many thorans :) looks super delicious and yummy :) loving the color of beetroot khicadi dear :) am drooling here !! That whole plate screams comfort good.. soooo good. Awesome! I love the century old houses..So much history is hidden in them and so many memories as well..
That’s. so much in one platter and everything seems so colorful and inviting! Delicious. I love beetroots for the colour and flavour. Looks amazing. Simple yet delicious dishes Rajani. I wonder how you mange to write so many recipes for a day’s post! And I love that courtyard pic. I have a plan of a dream house where I want such a courtyard. love the color and the flavor of the beetroot… also the mild sweetness they have!! Love that kichadi color both thorans are my favorite perfect.. 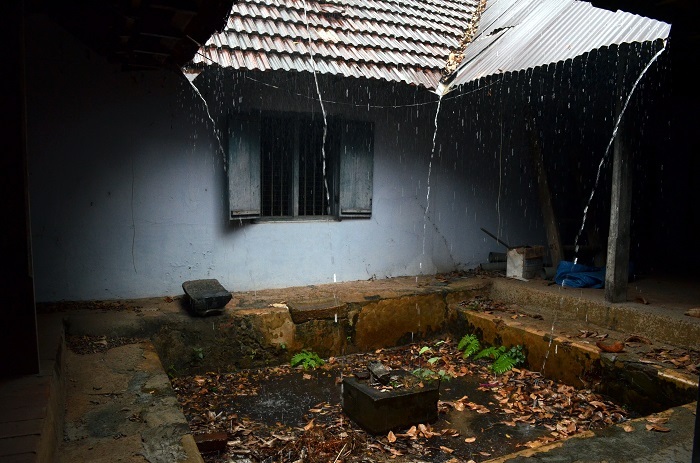 Wow..I love this old house..my husband always wanted to build a house with a open courtyard in the center…rooms all around..well looking at this pic reminded me of his dream…we have the open courtyard but on a side…and I am loving the Sadya recipes. The meals are simple but very traditional..something that only you can explain and present so well. Love the info you are providing thru this marathon and liking the extra simple touches these thorans are getting. Never had heard about kichadi its something I will try. Thanks. In case I have not said it LOVE the post. Love the array of “B” side dishes..Your platter makes me hungry now..Thanks for sharing your Old house Picture and I am remembering my Granny’s House..